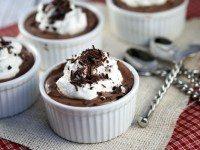 This Chocolate Pudding Recipe is the best classic chocolate pudding. So easy to make! In a large bowl, whisk the egg yolks, sugar and cornstarch. In a medium saucepan, combine the milk, chocolate and salt and warm over medium-heat; stir until the chocolate melts. Gradually whisk the hot chocolate mixture into the egg mixture (1/4 cup at a time), whisking quickly, until you have warmed up the egg mixture. Pour the egg mixture back into the saucepan and keep whisking until thickened- 12 to 15 minutes. Remove from heat; stir in the vanilla, then divide among 6 serving cups. Cover each with plastic wrap and refrigerate until well set (at least 2 hours). To make whipped cream: use an electric mixer to whip 1/2 cup of heavy whipping cream in a medium bowl. When it begins to thicken, add 1 tablespoon of powdered sugar and continue to mix until it reaches "whipped cream consistency." If you are preparing this recipe as GLUTEN-FREE, just be sure to use brands of chocolate and vanilla that are known to be GF.